Maybe you have seen a site like this one. Someone claiming to make $5,000 a month posting a link on google. 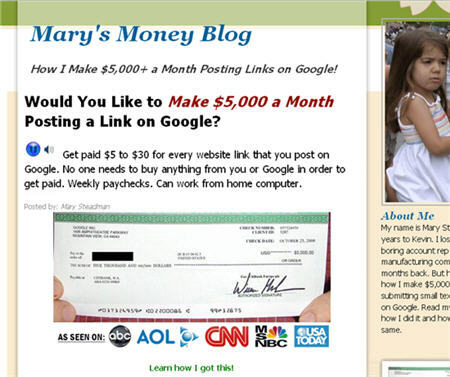 Typically the site is Someone’s first name Money Blog, in this case the person is “Mary”. It could easily be “Jay Wilson” or “Greg Williams” or “Cory Jordan” or “Jonah Battle”. 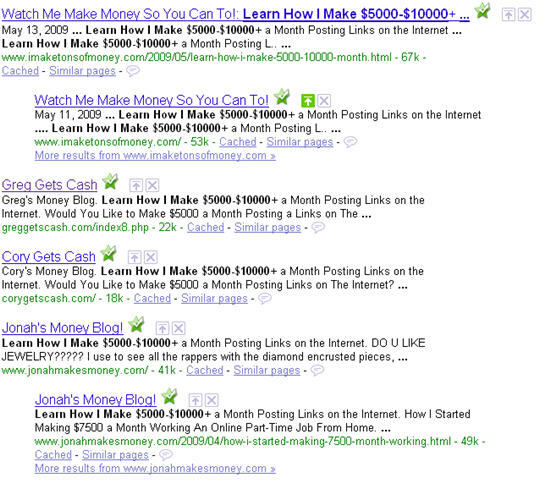 All of them seem to be able to Make $5000-$10000+ a Month Posting Links on the Internet. Good for them. What I don’t understand is why they all seem to have the same friends. When I say friends, I mean people who comment on their blog about how much money they make. 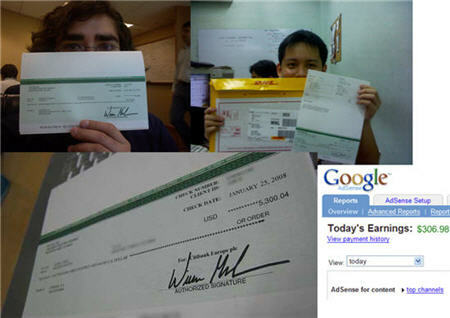 They show the same images: faces with checks in front showing how much money Google has paid them. Seems a little strange, but come on, $5,000 a month for anyone with a computer and basic typing skills can earn cash on Google. From the sounds of this, this should a slam dunk. Mary Steadman from San Jose, CA had a compelling story on how filling out one simple online form changed her life. She told me how she lost my job as a boring account rep for a manufacturing company a few months back, then changed her life by getting Google Biz Kit, Internet Biz Kit (have to have both, this is key), posting links given by Google, then finally depositing the checks that Google sends. By now, the frenzy is building, I’m thinking qualifying shouldn’t be that difficult. I mean, I have a computer and basic typing skills and the form that needs to be filled out seems like a no brainer. Just as I thought – I qualify! And this is where it ends. I know, I know, I’m only “one click away” from making up to $943 a day on Google, but they want my credit card information. Sure, it is only a $1.97 for shipping. But nowhere up to this point is a “full disclosure” of what exactly am I getting. I was surprised (maybe I shouldn’t be) not to find any earnings’ disclaimer. No where in the process of signing up did I find out if the results mentioned were typical or not. I back tracked a little – went back to Mary’s Money Blog, the cached version anyway – and found a disclaimer. It certainly wasn’t easy to find and I wouldn’t expect the typical web surfer to notice this. Why? Because it was commented out and did not show up on the web page! This publication provides the Author’s opinions and neither the Publisher nor the author intends to render legal, accounting, financial, business or other professional advice with this publication. With regards to licensing of a business enterprise, any legal accounting or tax matters. Author and publisher is an Affiliate of the company offering the business opportunity and are remunerated by advertiser. Author and publisher strongly suggest that the reader seek the services of appropriate licensed business, financial and or legal professionals before proceeding with any actions and comply with the local, state and federal licensing and guideline requirements which the reader resides or conducts business. The Publisher and Author disclaim any personal liability, loss or risk incurred as a consequence of the use and application of the offer, either directly or indirectly, of any advice, information, or methods presented in this publication. Individual comments are unedited and not the opinion of Author or Publisher and not liable for their comments and opinions. 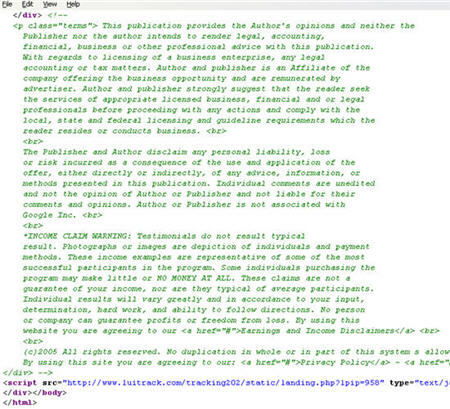 Author or Publisher is not associated with Google Inc.
(c)2005 All rights reserved. No duplication in whole or in part of this system s allowed without prior written authorization. So, here I sit $5,000 a month poorer for not signing up for the opportunity that Mary Steadman from San Jose has successfully used. P.S. – Seems that there are people out there that doubt the legitimacy of Mary Steadman’s opportunity – like the Electron Plumber. P.S.S. – For those willing to do some good old fashion work, there is opportunity to get paid by Google – click here to find out. P.S.S.S. – Getting a little more traction, Aaron Wall has written about “Google Money“.